It should also be noted that Metropolitan Jonah has been released to ROCOR. I do not have any details on the specifics of the release yet. 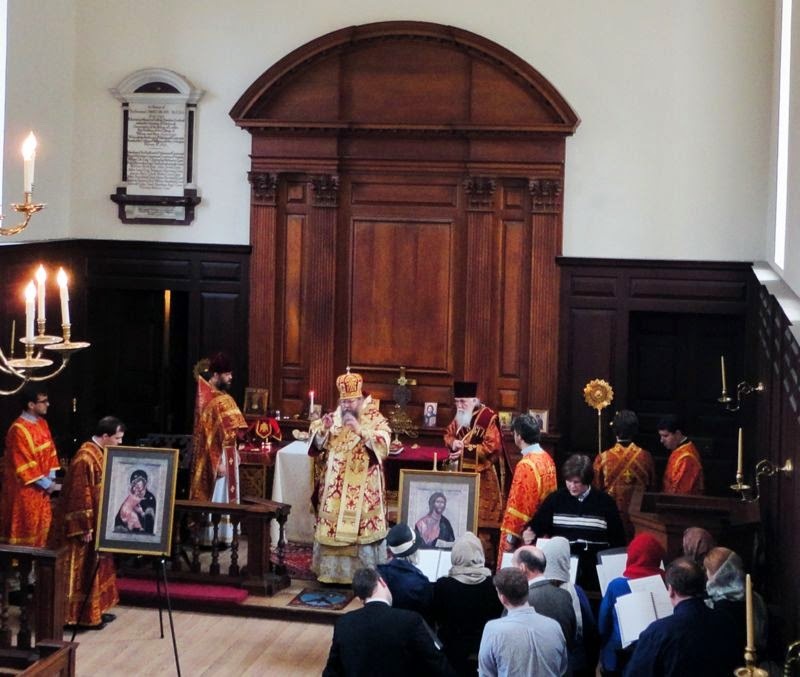 Williamsburg, VA (ROCOR-EAD) - On Sunday, March 16, at the request of the College of William & Mary’s Orthodox Christian Fellowship, Metropolitan Jonah (Paffhausen; former Archbishop of Washington and Metropolitan of All America & Canada of the Orthodox Church in America) celebrated the Divine Liturgy in the College’s Wren Chapel in Williamsburg, VA. He was co-served by Priest John Johnson and Protodeacon Leonid Mickle (clerics of St. John the Baptist Cathedral in Washington, DC). The Liturgy, held in the colonial capital of Virginia, is believed to be the first ever Eastern Orthodox Divine Liturgy celebrated in the Wren Chapel in the College’s Wren Building, the oldest college building in the United States. The Wren Building is a 10-minute walk from Col. Philip Ludwell’s house along Duke of Gloucester Street, the main avenue of colonial Williamsburg. Colonel Ludwell is the first known American convert to Holy Orthodoxy. The Liturgy was attended and supported by some seventy people, including faithful of numerous Orthodox jurisdictions from parishes in Virginia (including Williamsburg, Richmond, Culpeper, Northern Neck, and Fairfax), Maryland, the District of Columbia, and New York, with special assistance from the parish of St. John’s Cathedral in Washington and Holy Trinity Monastery and Seminary in Jordanville, NY. The President of the College, W. Taylor Reveley III, took time out of his busy schedule to attend the Liturgy, at the invitation of College students and alumni. Immediately following the Liturgy, a memorial service was held in the memory of Col. Philip Ludwell III and other members of his family who were known to be Orthodox, together with Metropolitan Laurus of blessed memory on the sixth anniversary of his repose. After the Liturgy, a reception was held, at which, with the blessing of His Eminence Hilarion, Metropolitan of Eastern America & New York and First Hierarch of the Russian Church Abroad, Reader Nicholas Chapman delivered a presentation on his latest research into the life of Col. Ludwell and his descendants. The reception was graciously organized by Washington-area Orthodox alumni of the College of William & Mary. Colonel Ludwell was himself a student at the College in the 1730’s, and that his father had served as rector there in 1716. Note: In 1977, Priest George DeTrana of St. Cyprian of Carthage Church (OCA) in Richmond, VA, served Vespers in the Wren Chapel at the request of the Orthodox Christian Fellowship. Any other historical information about such services would be welcomed. While I agree that this will likely occur there has been no notice of a canonical release from the OCA and no notice of reception via ROCOR. I don't have a source I can link to. When I do I will. Apologies. Yes, that sounds pretty clear to me. How amusing that we're finding out by youtube. Thanks for posting this link, Fr. David. Yes, matushka; it is amusing, but perhaps more to the point discouraging. However, it doesn't seem like we could expect much more from the OCA's Holy Synod after the way they've treated +Jonah & conducted themselves regarding him & his ministry over the last few years. I'm truly at a loss for words. May God grant Metropolitan Jonah many years! AXIOS! AXIOS! AXIOS!